Recent Arrival! CARFAX One-Owner. Clean CARFAX. AWD, Cloth. Certified. 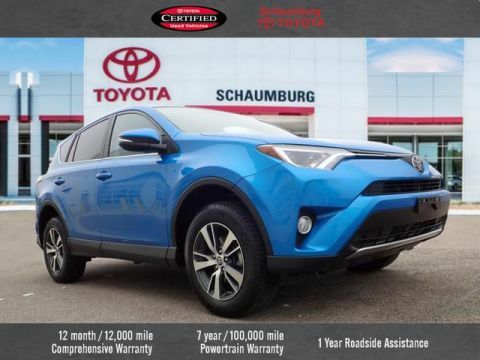 2018 Toyota RAV4 Electric Blue XLE 6-Speed Automatic 2.5L 4-Cylinder DOHC Dual VVT-i AWD Toyota Combined Details: * 160 Point Inspection (for Toyota Certified Used Vehicles program), 174 Point Inspection (for Toyota Certified Used Hybrids program) * Powertrain Limited Warranty: 84 Month/100,000 Mile (whichever comes first) from original in-service date * Roadside Assistance * Vehicle History * Transferable Warranty * Warranty Deductible: $50 * Limited Comprehensive Warranty: 12 Month/12,000 Mile (whichever comes first) from certified purchase date. Battery 8 years/100,000 miles (whichever comes first) from original in-service date. Roadside Assistance for 1 Year (for Toyota Certified Used Hybrids program), Limited Comprehensive Warranty: 12 Month/12,000 Mile (whichever comes first) from certified purchase date. Roadside Assistance for 1 Year (for Toyota Certified Used Vehicles program) Schaumburg Toyota - WHATEVER IT TAKES! - Come See For Yourself Why Today! Recent Arrival! CARFAX One-Owner. Clean CARFAX. 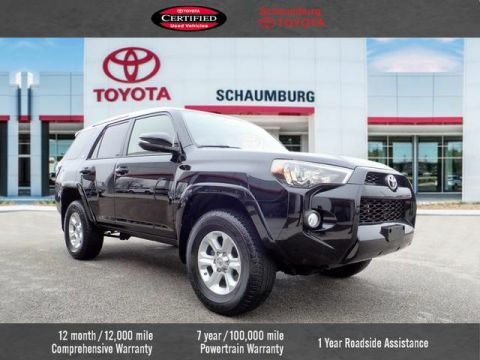 ** Toyota Certified- 12 month / 12k Mile Limited Comprehensive Warranty, And Much More! **, **Brake Assist**, **Back-up Camera**, **BlueTooth**, **MP3 | IPod Campatible**, **Premium Audio System**, **Alloy Wheels**, **4 Cyl. All the Power. Hates Gas**, **CarFax Certified - No Accidents**, **FWD - GREAT ALL YEAR 'ROUND - BETTER MPG!. Certified. 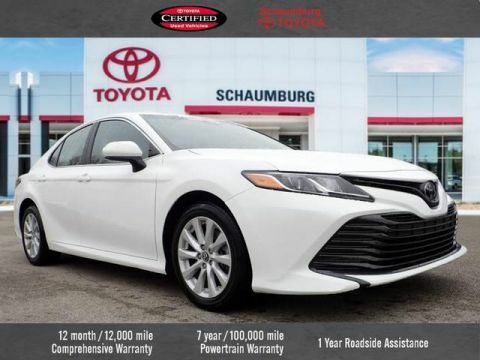 2018 Toyota Camry White LE 8-Speed Automatic 2.5L I4 DOHC 16V FWD Toyota Combined Details: * Vehicle History * Warranty Deductible: $50 * Transferable Warranty * 160 Point Inspection (for Toyota Certified Used Vehicles program), 174 Point Inspection (for Toyota Certified Used Hybrids program) * Roadside Assistance * Limited Comprehensive Warranty: 12 Month/12,000 Mile (whichever comes first) from certified purchase date. Battery 8 years/100,000 miles (whichever comes first) from original in-service date. Roadside Assistance for 1 Year (for Toyota Certified Used Hybrids program), Limited Comprehensive Warranty: 12 Month/12,000 Mile (whichever comes first) from certified purchase date. 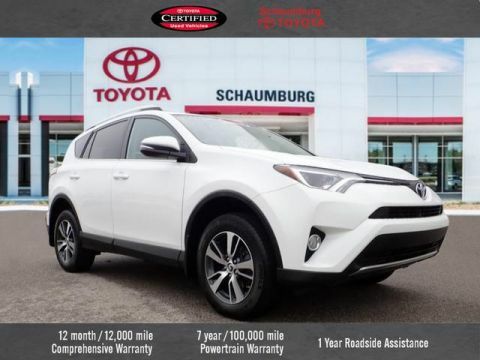 Roadside Assistance for 1 Year (for Toyota Certified Used Vehicles program) * Powertrain Limited Warranty: 84 Month/100,000 Mile (whichever comes first) from original in-service date Schaumburg Toyota - WHATEVER IT TAKES! - Come See For Yourself Why Today! Recent Arrival! CARFAX One-Owner. Clean CARFAX. 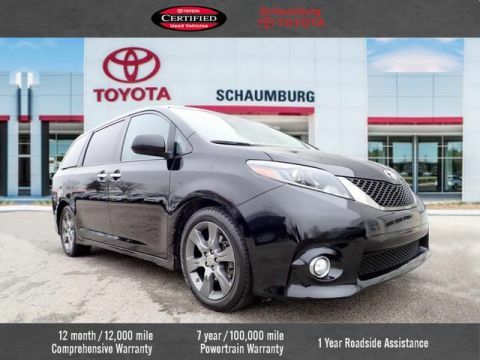 ** Toyota Certified- 12 month / 12k Mile Limited Comprehensive Warranty, And Much More! **, **Brake Assist**, **Back-up Camera**, **BlueTooth**, **MP3 | IPod Campatible**, **Premium Audio System**, **4 Cyl. All the Power. Hates Gas**, **FWD - GREAT ALL YEAR 'ROUND - BETTER MPG!. Certified. 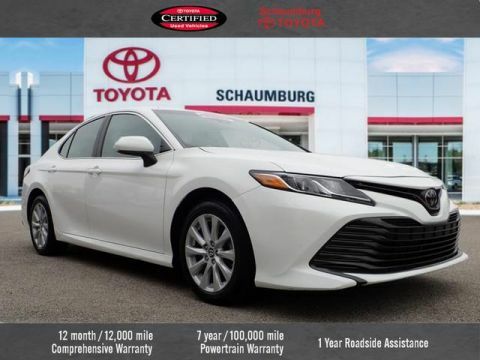 2018 Toyota Camry White LE 8-Speed Automatic 2.5L I4 DOHC 16V FWD Toyota Combined Details: * Powertrain Limited Warranty: 84 Month/100,000 Mile (whichever comes first) from original in-service date * Roadside Assistance * Warranty Deductible: $50 * 160 Point Inspection (for Toyota Certified Used Vehicles program), 174 Point Inspection (for Toyota Certified Used Hybrids program) * Transferable Warranty * Limited Comprehensive Warranty: 12 Month/12,000 Mile (whichever comes first) from certified purchase date. Battery 8 years/100,000 miles (whichever comes first) from original in-service date. Roadside Assistance for 1 Year (for Toyota Certified Used Hybrids program), Limited Comprehensive Warranty: 12 Month/12,000 Mile (whichever comes first) from certified purchase date. 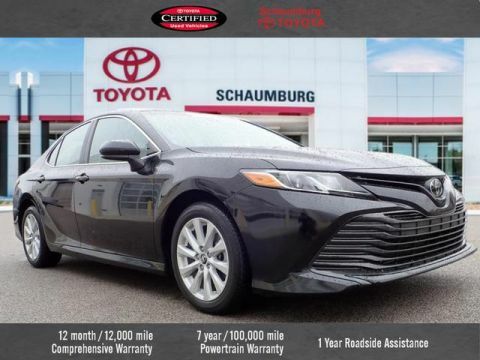 Roadside Assistance for 1 Year (for Toyota Certified Used Vehicles program) * Vehicle History Schaumburg Toyota - WHATEVER IT TAKES! - Come See For Yourself Why Today! Recent Arrival! CARFAX One-Owner. Clean CARFAX. ** Toyota Certified- 12 month / 12k Mile Limited Comprehensive Warranty, And Much More! **, **Brake Assist**, **BlueTooth**, **MP3 | IPod Campatible**, **Premium Audio System**, **4 Cyl. All the Power. Hates Gas**, **FWD - GREAT ALL YEAR 'ROUND - BETTER MPG!. 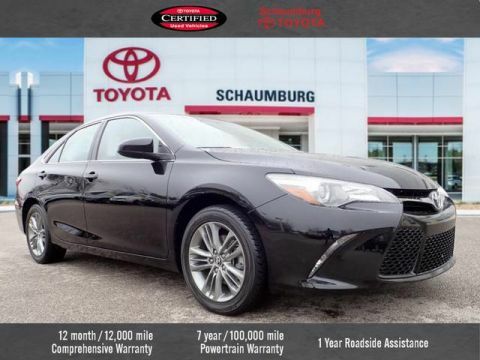 2018 Toyota Camry Black LE 8-Speed Automatic 2.5L I4 DOHC 16V FWD Schaumburg Toyota - WHATEVER IT TAKES! - Come See For Yourself Why Today! Recent Arrival! CARFAX One-Owner. Clean CARFAX. 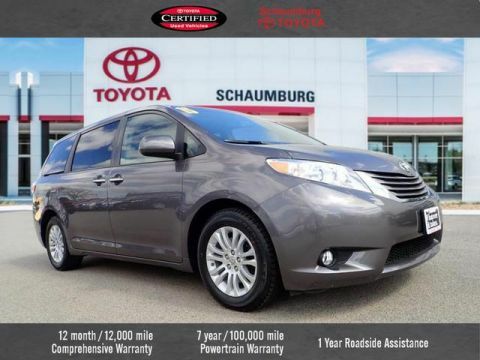 ** Toyota Certified- 12 month / 12k Mile Limited Comprehensive Warranty, And Much More! **, **Moonroof**, **Brake Assist**, **Back-up Camera**, **BlueTooth**, **MP3 | IPod Campatible**, **Alloy Wheels**, **Local Trade - Not a Rental Vehicle**, **4 Cyl. All the Power. Hates Gas**, **CarFax Certified - No Accidents and One Owner**, ** AWD - NEVER WORRY ABOUT THE WEATHER**, AWD, Black Cloth. Certified. 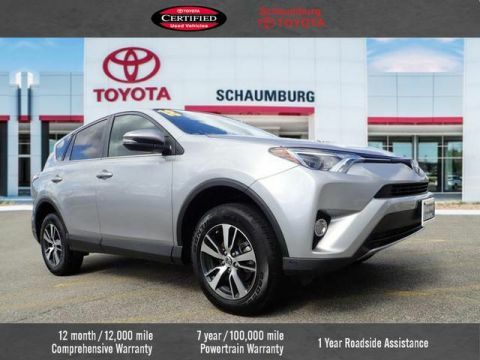 2018 Toyota RAV4 Silver XLE 6-Speed Automatic 2.5L 4-Cylinder DOHC Dual VVT-i AWD Toyota Combined Details: * Transferable Warranty * Powertrain Limited Warranty: 84 Month/100,000 Mile (whichever comes first) from original in-service date * 160 Point Inspection (for Toyota Certified Used Vehicles program), 174 Point Inspection (for Toyota Certified Used Hybrids program) * Vehicle History * Limited Comprehensive Warranty: 12 Month/12,000 Mile (whichever comes first) from certified purchase date. Roadside Assistance for 1 Year (for Toyota Certified Used Vehicles program), Limited Comprehensive Warranty: 12 Month/12,000 Mile (whichever comes first) from certified purchase date. Battery 8 years/100,000 miles (whichever comes first) from original in-service date. 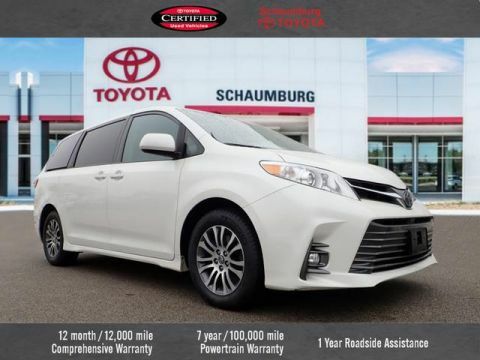 Roadside Assistance for 1 Year (for Toyota Certified Used Hybrids program) * Roadside Assistance * Warranty Deductible: $50 Schaumburg Toyota - WHATEVER IT TAKES! - Come See For Yourself Why Today! Recent Arrival! CARFAX One-Owner. Clean CARFAX. 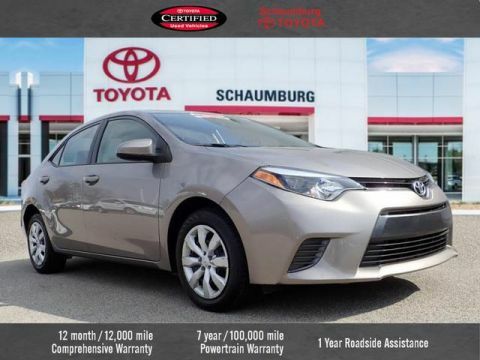 ** Toyota Certified- 12 month / 12k Mile Limited Comprehensive Warranty, And Much More! **, **Moonroof**, **Brake Assist**, **Back-up Camera**, **BlueTooth**, **MP3 | IPod Campatible**, **Premium Audio System**, **Alloy Wheels**, **Local Trade - Not a Rental Vehicle**, **4 Cyl. All the Power. Hates Gas**, **CarFax Certified - No Accidents**, ** AWD - NEVER WORRY ABOUT THE WEATHER**, AWD, Black Cloth. Certified. 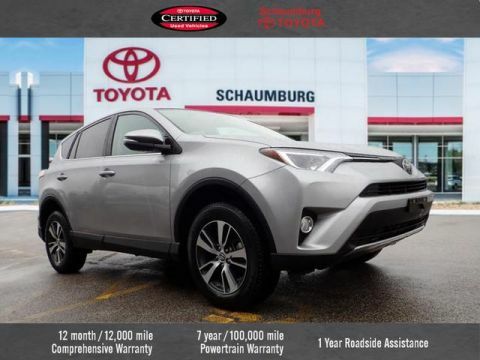 2018 Toyota RAV4 Silver XLE 6-Speed Automatic 2.5L 4-Cylinder DOHC Dual VVT-i AWD Toyota Combined Details: * Vehicle History * Limited Comprehensive Warranty: 12 Month/12,000 Mile (whichever comes first) from certified purchase date. Roadside Assistance for 1 Year (for Toyota Certified Used Vehicles program), Limited Comprehensive Warranty: 12 Month/12,000 Mile (whichever comes first) from certified purchase date. Battery 8 years/100,000 miles (whichever comes first) from original in-service date. Roadside Assistance for 1 Year (for Toyota Certified Used Hybrids program) * 160 Point Inspection (for Toyota Certified Used Vehicles program), 174 Point Inspection (for Toyota Certified Used Hybrids program) * Warranty Deductible: $50 * Transferable Warranty * Roadside Assistance * Powertrain Limited Warranty: 84 Month/100,000 Mile (whichever comes first) from original in-service date Schaumburg Toyota - WHATEVER IT TAKES! - Come See For Yourself Why Today! Recent Arrival! CARFAX One-Owner. Clean CARFAX. Certified. 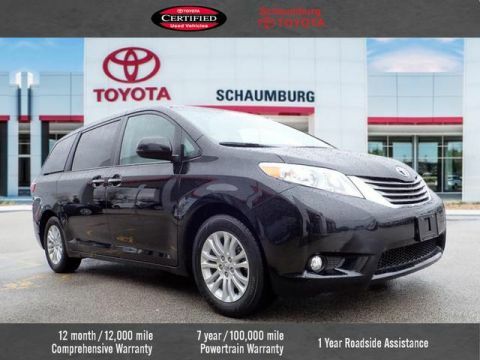 2018 Toyota Sienna Blizzard Pearl XLE 8 Passenger 8-Speed Automatic 3.5L V6 SMPI DOHC FWD Toyota Combined Details: * Vehicle History * Limited Comprehensive Warranty: 12 Month/12,000 Mile (whichever comes first) from certified purchase date. Roadside Assistance for 1 Year (for Toyota Certified Used Vehicles program), Limited Comprehensive Warranty: 12 Month/12,000 Mile (whichever comes first) from certified purchase date. Battery 8 years/100,000 miles (whichever comes first) from original in-service date. Roadside Assistance for 1 Year (for Toyota Certified Used Hybrids program) * Roadside Assistance * Powertrain Limited Warranty: 84 Month/100,000 Mile (whichever comes first) from original in-service date * Warranty Deductible: $50 * Transferable Warranty * 160 Point Inspection (for Toyota Certified Used Vehicles program), 174 Point Inspection (for Toyota Certified Used Hybrids program) Schaumburg Toyota - WHATEVER IT TAKES! - Come See For Yourself Why Today! Recent Arrival! CARFAX One-Owner. Clean CARFAX. ** Toyota Certified- 12 month / 12k Mile Limited Comprehensive Warranty, And Much More! **, **Brake Assist**, **Back-up Camera**, **BlueTooth**, **MP3 | IPod Campatible**, **Premium Audio System**, **4 Cyl. All the Power. Hates Gas**. Certified. 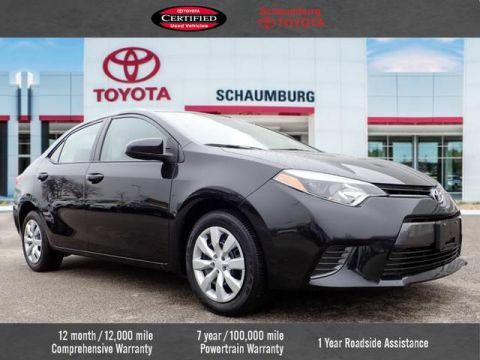 2018 Toyota Corolla Silver LE CVT 1.8L I4 DOHC Dual VVT-i FWD Toyota Combined Details: * Warranty Deductible: $50 * Vehicle History * Roadside Assistance * 160 Point Inspection (for Toyota Certified Used Vehicles program), 174 Point Inspection (for Toyota Certified Used Hybrids program) * Powertrain Limited Warranty: 84 Month/100,000 Mile (whichever comes first) from original in-service date * Transferable Warranty * Limited Comprehensive Warranty: 12 Month/12,000 Mile (whichever comes first) from certified purchase date. Roadside Assistance for 1 Year (for Toyota Certified Used Vehicles program), Limited Comprehensive Warranty: 12 Month/12,000 Mile (whichever comes first) from certified purchase date. Battery 8 years/100,000 miles (whichever comes first) from original in-service date. 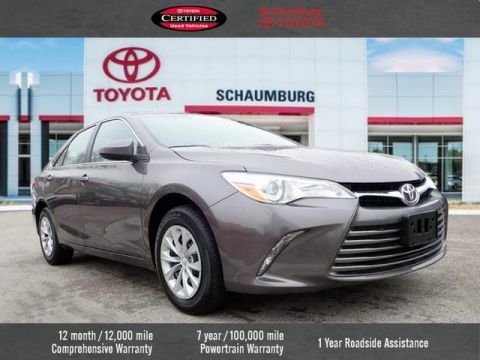 Roadside Assistance for 1 Year (for Toyota Certified Used Hybrids program) Schaumburg Toyota - WHATEVER IT TAKES! - Come See For Yourself Why Today! Recent Arrival! CARFAX One-Owner. Clean CARFAX. 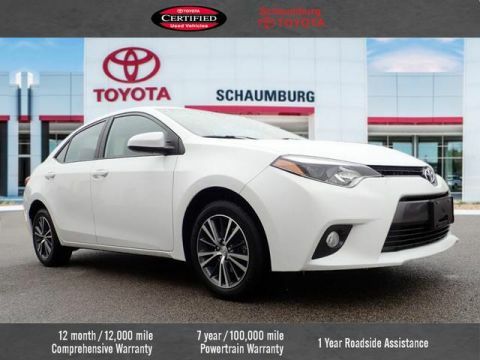 ** Toyota Certified- 12 month / 12k Mile Limited Comprehensive Warranty, And Much More! **, **Moonroof**, **Brake Assist**, **Navigation**, **Back-up Camera**, **BlueTooth**, **MP3 | IPod Campatible**, **Premium Audio System**, **Alloy Wheels**, **V6 - Great Pick-up**, **CarFax Certified - No Accidents and One Owner**, **FWD - GREAT ALL YEAR 'ROUND - BETTER MPG!, **Leather Seats**, 6-Speed Automatic ECT-i, Radio: Entune Premium JBL Audio w/Integrated Nav. Certified. 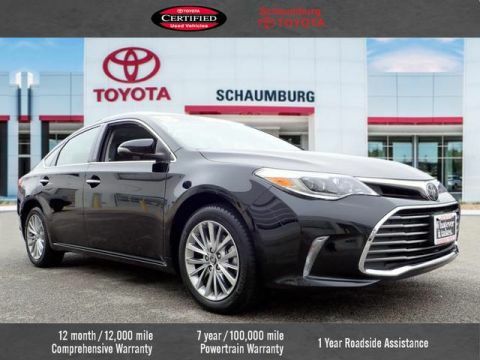 2018 Toyota Avalon Black Limited 6-Speed Automatic ECT-i 3.5L V6 DOHC Dual VVT-i 24V FWD Toyota Combined Details: * Roadside Assistance * Powertrain Limited Warranty: 84 Month/100,000 Mile (whichever comes first) from original in-service date * Vehicle History * 160 Point Inspection (for Toyota Certified Used Vehicles program), 174 Point Inspection (for Toyota Certified Used Hybrids program) * Limited Comprehensive Warranty: 12 Month/12,000 Mile (whichever comes first) from certified purchase date. Roadside Assistance for 1 Year (for Toyota Certified Used Vehicles program), Limited Comprehensive Warranty: 12 Month/12,000 Mile (whichever comes first) from certified purchase date. Battery 8 years/100,000 miles (whichever comes first) from original in-service date. 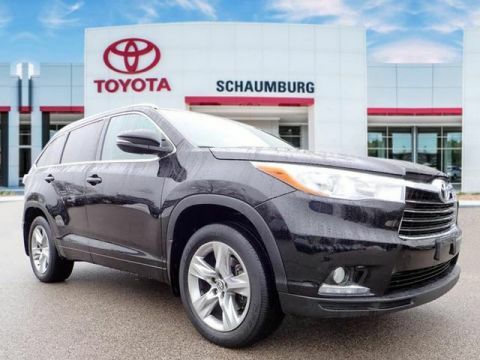 Roadside Assistance for 1 Year (for Toyota Certified Used Hybrids program) * Transferable Warranty * Warranty Deductible: $50 Schaumburg Toyota - WHATEVER IT TAKES! - Come See For Yourself Why Today!